Ma very kindly gave me a lift to Otley this afternoon, as I needed an urgent visit to Adelaide Walker's. 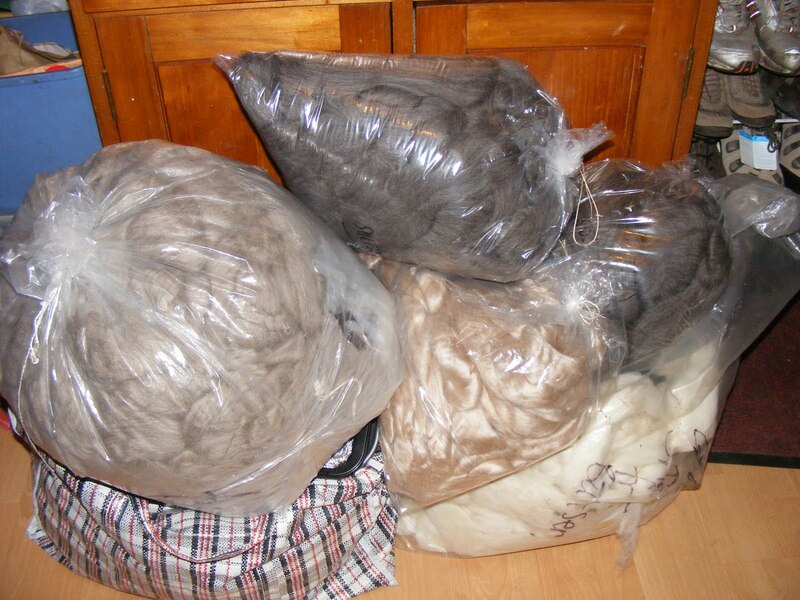 Here we have 3 kilos of oatmeal BFL, 2 kilos of mid-grey Shetland, and 600g of their gorgeous camel down/tussah silk. I thought I'd try the Shetland for something different - I can't remember anyone doing it at either of the main shows last year. It's a nice grey so should be good overdyed. I have a bit of the camel/silk still stashed from last year, so there should be enough for Wonderwool. Last year I sold out of all my exotics on the first day. Underneath these bags is the less than half bump of the fine merino, and various bits and pieces in the checked bag. Must start packaging the already dyed stuff soon - I actually have the labels already printed too. Ma was muttering a few weeks ago that I'd never actually made her a pair of mitts. So these were cast on for part of her Mothering Sunday present, but they were only handed over this morning as she gave me a lift up to Guild. 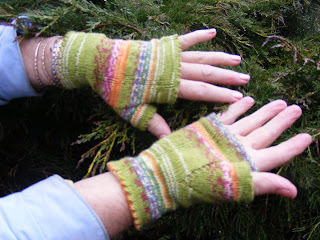 They're my slightly more hard-wearing version, hemmed at wrist, fingers and thum. Knitted in sock yarn, so they're washable too. Mark came with us and going through Shipley we stopped and picked up my new spin dryer. My old one is practically dead. While it still spins, the spout for excess water to pour through has fallen off. This doesn't matter, though, as the water just falls straight through the holes in the bottom instead of draining out the right way. And there's various holes in the side, covered in duct tape to stop water squirting out sideways. Everytime I don' t balance the fibre exactly and it thumps a bit before settling down, great chunks of rust flakes are rinsed out. But it's had several years of much harder work than it was ever designed to handle so it really doesn't owe me a penny. Now we have a new one, so I'll put the old one outside the door, on the other side of the lane, and like all vaguely metallic things I put out it will vanish overnight! Meant to dye this afternoon but didn't get back from Guild until well after three, by which time the rugby had started. And now there's a leg of mutton potroasting in the oven (with garlic, lemon, cinnamon, black pepper and cumin) so there's no room for dyeing. This is my latest lot of fibre going off to the Fibreholics assortment. It's the fine Ozzie merino in 'Crabapple', 20g sample bags. I really didn't want to see it go, I love what the colours have done this time. 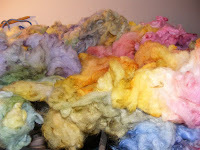 Vast amounts of dyed fibre being churned out now. It'll all get photographed as I package it, and colours will be posted up here. 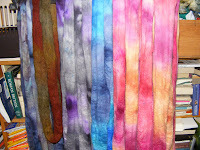 Second lot of dyed fibre hanging up to dry. The colours are lots more intense this year - I'm dyeing in the oven rather than on the hob - but these are photographed in haste in artificial light and it's washed them out. 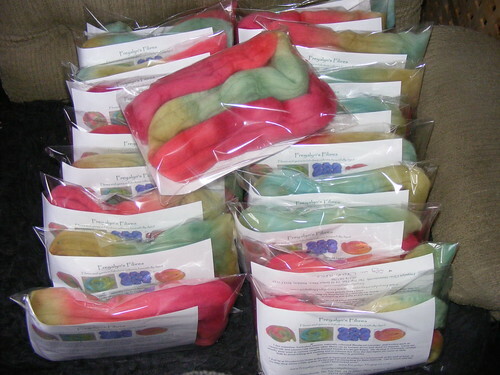 I have a Ryeland lamb fleece that will be dyed in lots of different colours and bagged up in little bags. It always seems popular, and I must trawl out the Teeswater lamb fleece I have somewhere for dyed locks. 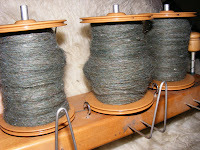 This is the sparkly fibre in the last post spun into three bobbins of singles. It's now a 3ply yarn hanging above the bath to dry - I rinsed it through in Mark's bath (before he'd washed!) and hung it above his head to drip - I then left him in the bath while I whizzed up the gym and had a lovely hot shower up there.